Chips Moman wrote this song and went on to have his own recording studio and production company in Memphis. It was at this studio that Elvis recorded some of his very finest work—and for those of you who think that Elvis died in the army, listen to his late 60's work, especially the magnificent "From Elvis In Memphis" LP/CD, and be impressed! Elvis was recorded singing part of this song in combination with "I Can't Stop Loving You" during a session at Chips' studios. Thomas Wayne was born Thomas Wayne Perkins in 1940, in Batesville, Mississippi. He was the brother of Luther Perkins, guitarist for Johnny Cash. 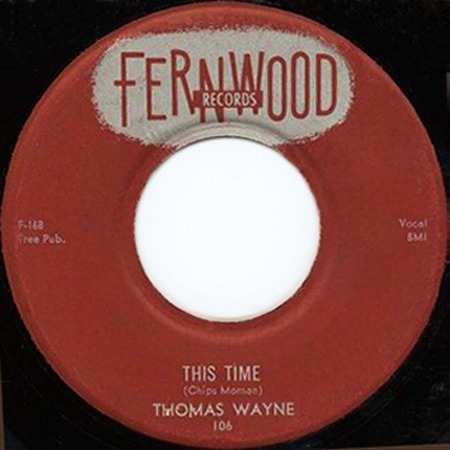 Wayne's original recording of "This Time" was first released in March 1958 on the Fernwood label, number 106, and again a few weeks later on Mercury 71287X45. Thomas Wayne died in 1971.